Each exhibitor is showing three pieces together with a photograph. 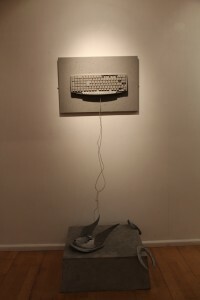 Here’s the text that I have written to accompany the exhibition, followed by images of my three exhibited pieces and my photo (‘At the Studio’s Threshold’) with its accompanying text. What do we actually do? Well, er… er… we assemble things, assemble semblances. In practice we’re recombiners. We gather things up from all over the place, loosely initially, then we put them very much closer – usually – together. We try to goad them, appealing to their better and worse natures, by coaxing, nudging, and guiding – recombining we call it – ‘em into position, effectively their last resting place. ‘Just for once stick together will you for our sakes’ we say to them. We cross our fingers and hope for the best. They have to be silent, very still and all surface. Just to be seen first of all, seen only and alone, entirely on their own as recombinant one-off surfacings. They make no appeal to any desires for the excitements of distracting movements and sounds. No subservience either to other people’s power, no electronic power or codings required to either incorporate or crack! All we, they, and any potential audience need is just enough light to attend to each recombinant’s idiosyncratic surfacing. Like many others (Bobby Rushmount – the Mount Rushmore of recombination – was an early bird with his combine constructions of bits and pieces filched from Amsterdam’s high-and-low ways) we’ve come to recognise the ways that ‘medium’ and ‘media’ have fallen into unrescuable disrepair and, with their petty-fogging rules, are no longer ‘fit for purpose’. ‘We’ll stick with the eyes’, we said, ‘but we’ll need to abandon medium’s restricting authoritative edges by mixing things up mightily. We’ll expand and contract according to each recombinant’s shifting demands. In so doing we’ll enter rooms, spaces, times, on quite different terms. Naturally we’ll keep on drawing, painting, and object-shaping as they are absolutely intrinsic to the drive of our assembling, but, no more privileging of materials and tools!’. We’re no sloganisers of course, but maybe something like ‘Genetic Equality for all Surface Candidates!’ would fit the (our) bill. 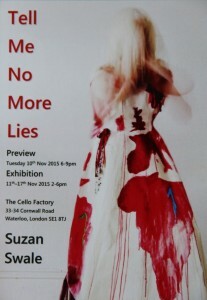 A fellow member of The London Group, the painter and multi-media artist Suzan Swale, has a retrospective under the title ‘Tell Me No More Lies’ at the Cello Factory, 33-34, Cornwall Road, London, SE1 8TJ, 11th-17th November, 2015, 2-6pm. The image on the show’s publicity card is of her installation ‘La Reine Margot’, (2012). I discuss aspects of her oeuvre in my essay – ‘Painting as Suspense’ – for the show’s catalogue. Here it is! 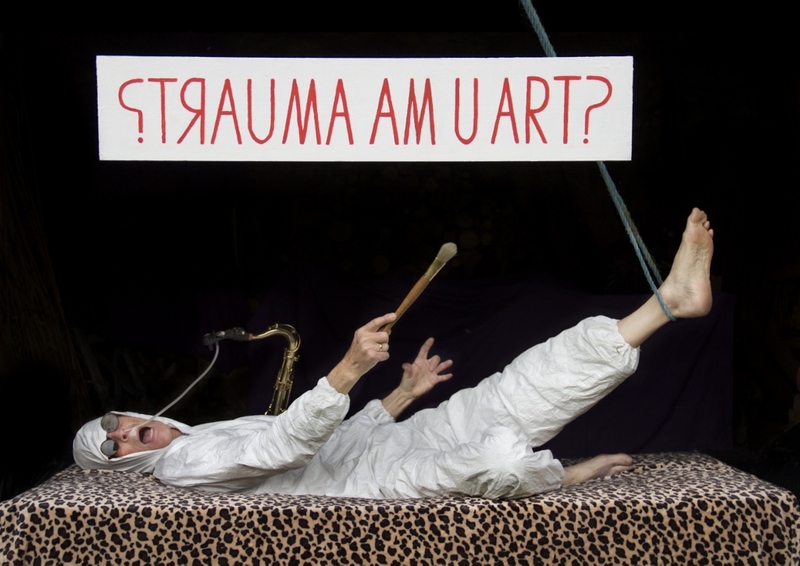 Of course Suzan has drawn a miscellany of materials and processes (photographs, clothes, electric light, words, performance) into the play of her making. But painting is her home-zone, her source, resource, and point of perennial return. Throughout her oeuvre she deposits multiple clues to what drives her to live under painting’s demands. It is her love and feeling for painting’s still open celebratory possibilities that guide her responses to the other media and objects. Take ‘Still Red’! Here the two words, set into and brought into play by the paint surrounding them, draw us into the tension that marks her creative trajectory. For, surely, she strives to survive as a painter by situating herself precisely in the gap between them: the ‘still’ and the ‘red’ – two seemingly simple words with multiple complex and ambiguous resonances. To be painting ‘still’ is, on the one hand, to seek to commit oneself to explore ceaselessly, to live within, the movement – flow – that defines the substance and event of painting. On the other hand it is to recognise simultaneously that the destiny of one’s making-for-art is a perfectly still thing: the event of painting ends by painting itself into stillness. Each painting’s potent hope is to move us precisely by its very motionlessness. And ‘red’ enacts a similar tension that seems to be marking the ungraspable centre of Suzan’s journey through painting. For, as so many of her renderings of the human figure show, red is the real and symbolic marker of our red-dependency and -indebtedness: we are red-embodied flowings. And we spill this flow incessantly across diverse contexts. But the taken-for-granted cultural work of the word ‘red’ is also to act as the synonymous marker of an ethico-political vision. Still-red-painting situates its task within this tension. It is a tension whose poles – absolute tranquillity (stillness) and pure community (history’s after-life) – are precisely other to everything that now constitutes our everyday life. To seek to survive in between the ‘still’ and the ‘red’ – to keep on painting right there by combining them – is already to show the event of art-making as a leap toward otherness: art makes for that which is not-yet. This leap into otherness is precisely the difference that art strives to make; it is how it seeks to differentiate itself from all other sites of action. And Suzan’s idiosyncratic journeying ‘in between’ is marked by utterly distinctive concerns. When, commenting on her own writing and echoing Virginia Woolf, the wonderful American writer Elizabeth Hardwick says that ‘Many things happen between the acts’ , she is gesturing, however obliquely, toward the gap where artists, irrespective of medium, seek to situate their making: they aim to site their activity in between the familiar outlines of recognisable acts. And of course each artist seeks to feel out, float in, and shape, their responses to this groundless gap in a distinctive way, a way that shows their knowing love for art’s living history. Relying absolutely on the strangeness of their own being-in-between, makers suspend the familiar boundaried and already meaningful acts of the theatre of everyday life precisely in order to broach their distinctive zone of unknowing. And what goes on ‘between the acts’ is, as Suzan’s paintings show us, invariably more elusive, troubling, and risky than hanging on in the relative comfort zones of commonsense. In marking out the course of her own ‘in-between’ across a range of media Suzan draws us inexorably into the play of suspension. But, in suspending herself in making’s gap, Suzan soon began to reveal this very suspension as the recurrent focus of her ways through art. Specifically, it is our suspended embodiment that emerges as her defining motif and challenge. She sets herself the task of realising visually the unspeakable feelings engendered by our groundless suspension as we struggle to feel our way through the always conflicting demands of multiple social contexts, contexts where power is already at work in unseen ways. Already in her earliest paintings (‘Wuthering Heights’, ‘The Invisible Backward Facing Grocer’, ‘The Woman in the Moon’) Suzan had begun to explore ways in which paint could halt the free-fall of groundlessness and show the fateful character of our suspension. Paint allows her to still the body-in-suspension and open onto its predicament. Specifically this is a body (and often bodies) suspended in a no-space or across several incommensurable conflicting spaces. But this suspension is differently nuanced as she moves across media and materials. As it recurs, the framed body is not just ‘any’ body. Always particularised and contextualised by each painting’s or object’s emergent spaces and demands, she offers embodiment, and especially woman’s embodiment, as perennially at risk: to be embodied is to live on while always at risk – at risk of damage, wounding, fragmentation, suffering… Yet this edgy living is always there to be celebrated and, in some part, hopefully redeemed by painting. Painting here takes on the body’s always unpredictable passage through risks, dangers and disasters, as its way of celebrating the body in whatever it undergoes: the suspended body-in-damage is rendered heroinic/heroic. These suspended bodies, their fragments and accoutrements (words, instruments, clothes, and words, always words…), invariably caught up in and caught out by demands beyond their control, nevertheless remain there still. 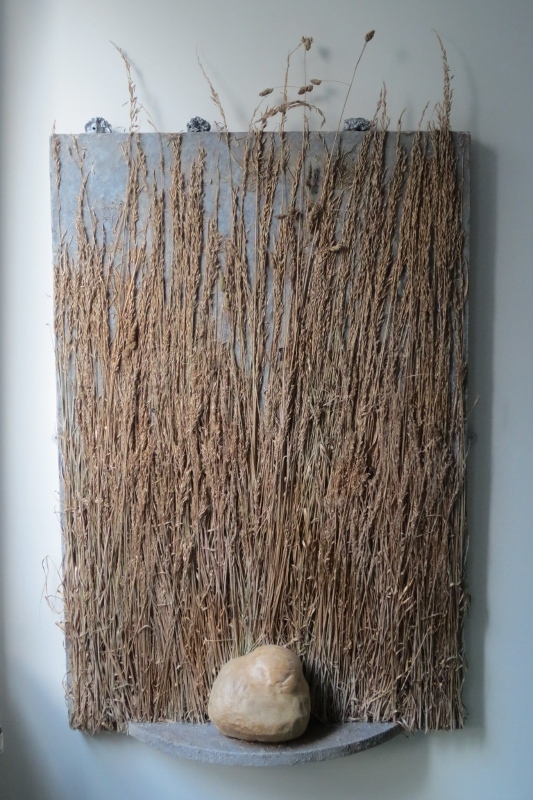 Interrupting and catching them in mid-act – embodiment as always under way, falling, standing, collapsing, lying right there – Suzan offers her painting project as a pledge to hang onto them somehow. She keeps them held up in the face of their immanent disappearance, fixes them strung out across the irreconcilable spaces (shown by her canvases’ striations, layerings, stripings) which catch us all out. By splitting open the all too routine and familiar acts in which bodies are subjected to disturbance, deterioration, and loss, she proceeds to give them a different life, a still life, on art’s terms. Her figurings (they include, of course, animals, birds, clouds, scapes, flowers, the architectural and designed furnishings of the everyday, and much else), stitched into and across the canvases’ often striated surfaces, frequently confront or are caught up in the machined representations of global mass culture. Filmic and photographic imagery become both a resource and target that painting has to engage as it tries to hold on to its own possibility in the face of their simulated naturalisms. 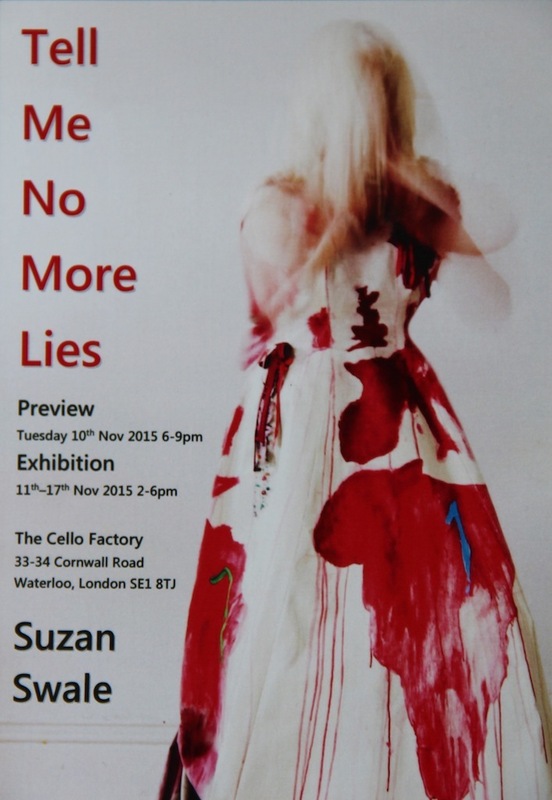 Suzan recognises that painting can take on the photograph and the film-strip clip. That is, it can both mime and undo – subvert and scatter – them. For her, this challenge is exemplified by the ways the Hollywood-holy-word-and-image-machine sets the terms against which everyday experience, perception, and meaning struggle to make their ways. Under this Disneyfication of the world the integrated life of language and image is endlessly suborned by info-entertainment. As long as we are machinically informed and entertained without a break we are supposed to be OK. And, for Suzan, the archetypical figure for this process is Mickey M. (Minnie is significant by her absence in the paintings…) who pops up all over the place as a diminutive ‘everyman’ (or at least, given his short pants, everyboy). There he is, again and again, with his ears as ever turned rigidly forward so that he can hear (see?) only that which is right in front of him. And we are all familiar with this cartoon figure’s reassuring routinely miraculous escapes from whatever-threats; they seem to mark an extreme edge of cultural fantasies about the fate of (male…) embodiment. Mickey, the arch-mass communicator emergent post-man, becomes an exemplary double – the US male that bears the US mail’s prime message. Indeed, in the two ‘US Mail’ pieces Suzan offers this as an open and shut case. Mickey appears as motif for a repetitively patterned wallpaper that perhaps stands as the backcloth to all our everyday communicative acts, precisely the acts between which Suzan’s paintings aim to insert themselves on art’s and our behalf. 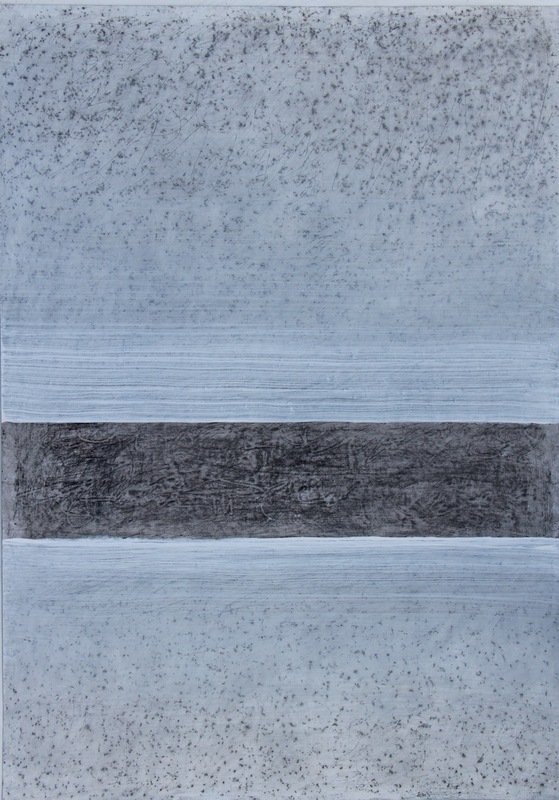 Delighting in the very matter of paint – its flowing manipulability and ability to transport us into her utterly distinctive elsewhere – Suzan faces us with the challenge of seeing anew through her bravura handling of this earthy stuff. Effecting a slit in the camouflaging fabric of the everyday, her paintings and objects invite us to pass from the commonsense of the without in order to feel out for ourselves an unspeakable within. The surfaces of her varied projects cajole us into tracing out for ourselves some of the ways the tremulous fragile body finds itself perennially at and as the living taut conjunction of always warring irreconcilable powers. At the least, Suzan’s oeuvre proposes, the leap away though art’s offerings may just move us to reconstitute for ourselves our dependence on such powers’ potency, to loosen however slightly the ligatures within which powers routinely bind us. Elizabeth Hardwick, ‘Sleepless Nights’, Virago, London, 1980, p. 121. See also Virginia Woolf’s extraordinary final novel, ‘Between the Acts’, published after her death in 1941, Vintage, London, 2000. 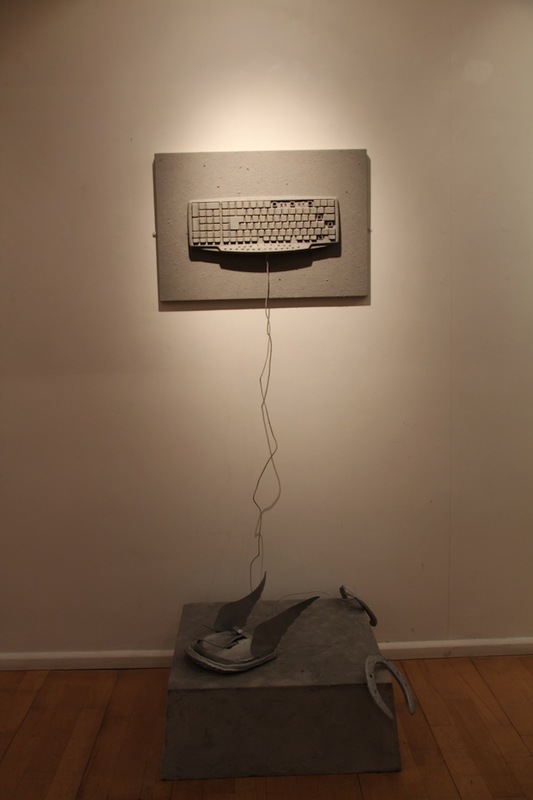 I exhibited ‘white noise broadband’ (mixed media on paper, 60cm x 40cm) in Part 1 of ‘The London Group Open 2015’ exhibition at The Cello Factory, 33-34, Cornwall Road, London SE1 (13th-23rd October). Here, in addition, is the essay I wrote for the catalogue documenting Parts 1 and 2 of the exhibition. 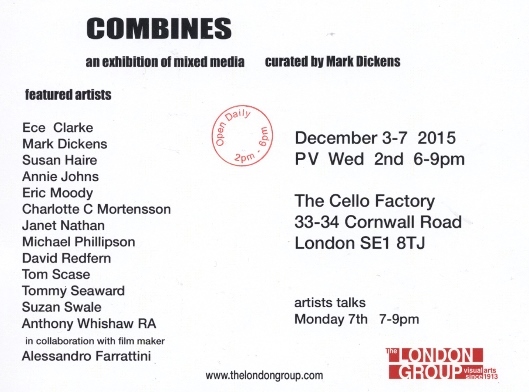 Aaaaah, yet another ‘open’ offered up to an already art-saturated fluid London-without-boundaries! But what might possibly differentiate the London Group ‘open’ from the plurality of ‘open’ exhibitions offering exhibiting opportunities? Could its biennial re-appearance be repeating a gesture that still echoes, however faintly and idiosyncratically, the Group’s own defining differentiating concerns at its now long distant inception? That it still can perform such a renewing reminder is, of course, precisely the hope of its current members. But such an echo, inevitably distorted by its passage through the intervening years’ strangeness, will also be slightly aslant from the Group’s originating call. We are all only too familiar with the chaotic changes that continue to mark our now senescent modernity’s halting passage through, off, and away. At its inception the Group’s defining reason was to offer its members’ responses to the inexorable emergence of a distinctive ‘modern’ vision of the arts’ possibilities. In its early years its annual exhibitions sought to show the challenging delights of members’ responses to this emergence. But surely today, a century or so on, the ‘modern’ (including all its supposedly ‘post-’ off-springs) is securely pinned down for us by and in a global apparatus (simultaneously both very solid and ungraspably virtual) that mounts, centralises and endlessly reproduces its ownership and routine control of this vision? Perhaps the possible ‘difference’, the partial detachment, that the Group’s exhibiting events (and especially its rejuvenated biennial ‘open’ which also doubles as a members’ annual exhibition) seek to perform and display is grounded in the collective commitment that generates its self-sustenance. The Group is a collective held together by an idiosyncratic and perhaps largely implicit notion of detachment. It seeks to detach itself from the authority of all external interests. Yet, simultaneously, it seeks to sustain itself by trying to hold to a paradoxical sense of attachment: its activities articulate a hopeful vision of the virtues of participating in a singular cooperative project. Members cooperate around their shared attachment to the one deeply internalised ‘external’ to which all commit themselves: the legacy offered by the arts’ modern tradition as the challenging open promise to all potential makers of celebrating their difference. The founding moderns made patent their realisation that art-making was to be an open zone of diversity in which pursuing the possibility of art for oneself required each maker to explore and manifest their ‘own’ responsive difference to the tradition’s challenge. Every cooperative venture of the Group exemplifies this legacy through making explicit the one thing that holds the members together – the absolute difference of each’s felt experience of and response to this challenge. In a sense this is what the Group’s exhibitions, including above all its biennial open, exhibit first of all. In participating in a Group exhibition each piece restates this as its first ‘meaning’; the very act of exhibiting is a display of sharing in, being gathered up into, a cooperative project. This is its defining gesture. Each exhibited piece’s ‘content’ (materials/subject/themes/whatever), while being precisely its way of manifesting its absolute difference from everything else on show, is, in a never quite definable way, subsidiary to this sense of being first of all ‘for’ the collective. In the act of cooperation each piece becomes ever so slightly both less and more than itself! We thus cooperate only in order to show that the challenge facing every maker-for-art is for each to find, hold to, and show their unique differences aside from all institutional requirements. 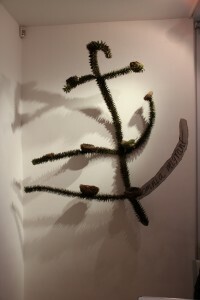 It is a recognition that the Rimbaudian demand ‘to be absolutely modern’ requires each maker-for-art to pitch themselves permanently into making’s defining tension: one celebrates one’s utterly personal relation to the multiple delights of art’s traditions only by making something that rehearses anew on each occasion the open question of art’s possibility. Whatever emerges from each maker’s performance enacts a response to this open question – have I given this felt-thought thing an outside chance of attachment, of being gathered in, however marginally, to art’s open tradition? By facilitating the chance to pose and re-pose this question collectively in the company of others the Group can, at best, offer a very tentative ‘yes’ in hopeful response! Thus, if there is a resonating legacy of the Group’s founding concerns this is, perhaps, the one ‘thing’ that still echoes through to us down the years. And if, today, the Group cooperates in trying to maintain some shreds of this vision-for-art, then this is what may put it quirkily at odds with the seemingly authoritative demands made on makers by the surrounding art-representing institutions. Eschewing the totalising and now institutionalised distancing narratives of art history and aesthetics, the Group’s ‘thinking’ about its collective task occurs at and moves out from the indefinable space-time of practice – the zone where makers-for-art, each slightly differently, seek to sustain themselves. The Group’s hope is that its quirky mode of cooperation may just be able to facilitate, however slightly, this sustenance. Lacking any ‘home’ and operating independently of external financial support, the Group opts for a view of art’s possibility at street level and in the midst of things. In common with the majority of contemporary art-makers it performs as a necessarily vagrant exhibitor relying on negotiating occasion-specific alliances with possible showing spaces. In this way it shares the real recurrent everyday problems of all those committing themselves to surviving as lone makers-for-art in always difficult circumstances. It knows at first hand the extraordinary diversity of media that now characterises making’s diaspora and, even within the limits of its exhibiting spaces, it attempts to respond to this diversity in both its open exhibitions and its recruitment of new members. Its offer to potential members is primarily the possible promise of its idiosyncratic model of cooperation. Occasionally its activities generate bonuses from supporters such as the prize monies offered in the present ‘open’ (for which we are very grateful!) that help to raise its profile. And recently our vagrancy has been temporarily interrupted through the hospitality generously afforded us by Susan Haire at the wonderful Cello Factory. But all members know that such offers have a limited life and do not compromise the Group’s detachment. Indeed each of our ‘open’ exhibitions re-affirms this detachment by being just a ‘one-off’. No ‘open’ can be taken as a representative sample of a relatively stable population of makers ‘out there’. Nor is it an index of some assumed ‘current state of art practice in London (or anywhere else)’. Each is occasion-specific and sufficient to itself – it is what it does. 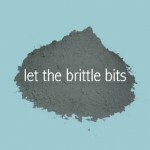 And therein perhaps lies the possible virtue of the ‘little nothing’ that it performs: its necessarily accidental quality can act as an interruptive reminder that the apparent continuities and self-confident narratives of the surrounding art-representing machinery are fictions constructed out of interests entirely alien to those of makers. 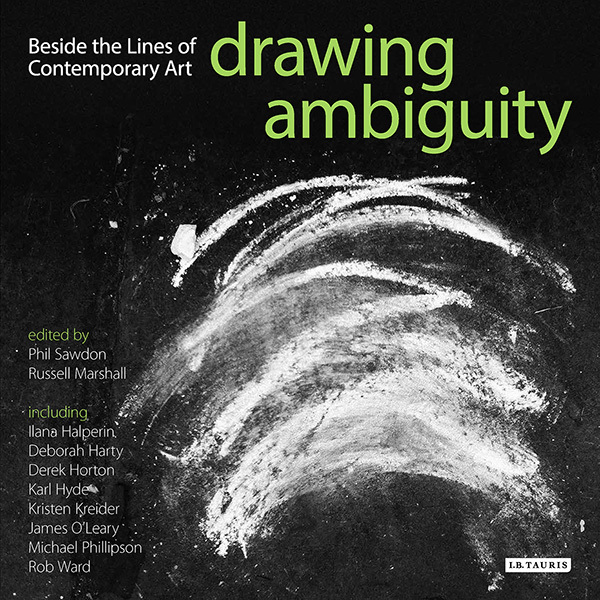 In this collection of readings, edited by Sawdon and Marshall, I offer an expanded sense of drawing as a site of embodiment, language and breath. Works by Giuseppe Penone, Susan Skingle, Shirazeh Houshiary, Heather Phillipson, Jordan McKenzie and others are considered in relation to the process of drawing.